Congratulations to Gary from Danne Montague-King who won a 4 night holiday for two to Hamilton Island. If you haven’t heard about our competition you can read more here – it’s easy as baking a cake. Essentially you need only to share the details of someone and their business that might be interested in MYOB Enterprise Level Software Solutions, like MYOB Exo or MYOB Advanced. Then, twice a year, we take all of our referral clients, put their names in a hat and “Hey Presto!”, draw the winner. The one lucky duck, lucky enough to be drawn then has a difficult choice. They can either indulge in a 4 night getaway holiday for two on Hamilton Island, or refine their tastebuds with 6 bottles of select Penfold Grange. Kilimanjaro Consulting has been running our Client Referral Competition for 3 years now, and we are very happy to see that our clients recommend our services to their friends and colleagues. These connections made between clients and prospective clients helps re-inforce the statement that our clients are happy clients. It also builds a strong basis of co-operation between businesses Australia-wide. 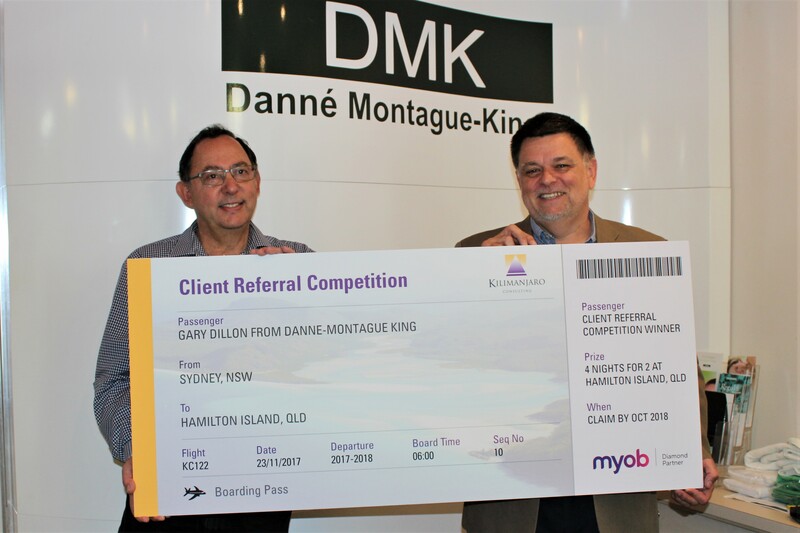 Last week we had the amazing opportunity to visit our Client Referral Competition Winner Gary Dillon from Danne Montague-King (D.M.K. ), who elected to go away on a four night holiday for two to Hamilton Island. Our journey with Danne Montague-King began 10 years ago, when we first met to discuss software opportunities. We realised that MYOB Exo would be a great fit and would allow the company to improve efficiencies and grow as their needs changed. Not only are they users of Exo, but also two additional Connected Services, being BlueEchidna and Phocas. We are pleased to see our client making great use of Exo Products and the associated solutions. We would like to thank Gary for all the trust he has put into Kilimanjaro, as he had confidence in putting us in contact with one of his colleagues. It’s an honour to be Danne Montague-King’s trusted advisor. Wishing you an amazing holiday, Gary. We hope to see more photos this time from the trip to Hamilton Island! A reminder to all Sherpa’s and clients that the next round of our Client Referral Competition is now open, and will be drawn in April 2018. Click here to be one step closer to your dream getaway!